Dr. Glendale-Hilmar Kaiser (usually referred to as Dr. Hilmar Kaiser) is a German-American historian who completed his Ph. D. in European University Institute in Florence, Italy. His educational focus is Ottoman Social and Economical history, and Ottoman-German relations. Most people regard him as a genocide scholar for his work dealing with the disputed Armenian Genocide. Kaiser has conducted research in more than 60 archives including the Turkish-Ottoman Archives in Istanbul. He has written a book called "The Memoirs of Abram Elkus: Lawyer, Ambassador Statesman." It's about Abram Elkus who was the American ambassador to the Ottoman Empire after Henry Morganthau. He has worked in the Armenian Research Center of the University of Michigan. In his lectures many Armenians are invited and usually Armenian organizations fund the lectures and sponsor Hilmar Kaiser. However, Turkish-Americans do come, and respectfully and calmly discuss and ask questions to Hilmar Kaiser. Many times though, the moderator seems to spot the Turkish-Americans and try to ignore their questions and not let them speak (Because sometimes questions can stump Hilmar Kaiser). He made a poor attempt at naming in Turkish Ottoman cities and officials. With terms such as, “Turkish criminals”, “Turkish crimes against children”, and Turks described as, “pathological rapists”, any semblance of an “intellectual” discourse became non-existent! His tirade continued to the pleasure of the Armenians; and though he was an ethnic German, he was very critical of the Germans during the First World War. Anyone who claims an ethnicity is filled with "pathological rapists" has some serious intelligence problems, let alone intellectual problems. Very early in the lecture I had asked a question, and after the moderator would not allow me to speak further, voices from our group demanded: “Let him speak! Let him speak!” The speaker and every Armenian in the room were on the verge of shocking disbelief when in a clear and audible voice, I had revealed my Armenian-Syrian Orthodox background. Just before the lecture was closed, one of our young men stood up and resolutely requested I be allowed to make a final comment. Mr. Kaiser must have been intrigued — to say the least — by this Armenian who with his Armenian wife was seated among these “reincarnated” Young Turks. Though one minute was requested, our generous speaker granted me two minutes. I referred to a so-called Talat Pasha telegram which had been fraudulently published by Aram Andonian. On the forged “document” Andonian had written at the top of the page the word: “Bismillah”. I revealed that no official Ottoman document had this word printed on it. The speaker looking at me intently, nodded his head affirmatively. When I added that the forger Andonian had dated the fake telegram according to the Gregorian calendar instead of the Moslem calendar, the “learned” speaker while nodding his head affirmatively, added: “He was off by thirteen days!” I made comments about the following names: Mark Bristol, Yarrow, and Barton. With each comment the speaker continued to nod his head. He knew well of what I was speaking, and what was most interesting was not what he said, but what he DID NOT say! briefly referred to: An elderly Armenian lady and a young Armenian girl approached me with favorable comments. According to a website, Hilmar Kaiser said that the Ottoman government planned the deaths of 1.5 to 2 million Armenian scholars. This could be accepted by the lay man who doesn't know the population of Armenians in the Ottoman Empire during the 1900s but, this table provides multiple sources of Armenian populations within the empire within 10 years of 1915. There was over a million Armenians living in Russia, and 3 million total Armenians world-wide. And today there is 9 million worldwide and 3 million inside Armenia. If you do the math, you'll find that the Armenians would have to triple the rate at which China makes babies and assume that Armenian males can also be impregnated. Despite his unverifiable research about how "true the Armenian genocide must be," it is clear that his peers do not appreciate him as much, and it is also clear that despite all this, he does seem to have a more open-mind than the extremists. AGH team regards Hilmar Kaiser as the best historian on the side of the Armenian-Genocide-Recognition promoting groups. It seems that even though no Armenian-Genocide promoting historian would go to the Turkey to read the Turkish archives, this historian actually strayed from the advice of his mentors who have written anti-Turkish books for decades and tried to do his own research. Perhaps in the future he will find out more interesting facts, and even if he continues to support the Armenian cause of unquestioned and unified acceptance of the Armenian genocide thesis, he may bring us closer to the truth, regardless of what the result is (If valid and verifiable research proves that it was indeed a premeditated genocide, then the AGH team would immediately rename itself and support that viewpoint). Hilmar Kaiser is a scholar of the Armenian genocide who is also known in scholarly circles and the Armenian community for the controversy he generates with some of his lectures and interviews. We first sat down at the editorial offices of the Aztag Daily in Beirut on Sept. 22, 2005, for a fascinating interview about the Ottoman archives and the Armenian genocide. Kaiser received his PhD from the European University Institute in Florence, Italy. He specializes in Ottoman social and economic history as well as the Armenian genocide. He has done research in more than 60 archives worldwide, including the Ottoman Archives in Istanbul. In this interview, conducted in Boston in Dec. 2007, Kaiser discusses the archives and speaks about his views on Turkish scholars—both the liberals and state-sponsored genocide deniers. Khatchig Mouradian—Let’s talk about your Turkish colleagues and how they approach the Armenian issue. Hilmar Kaiser—When I looked in Turkey over the past year for organized “academic” treatment of the Armenian issue, I could identify at least eight centers, which are in competition with each other; and then, within the centers there is competition. What you have there is a flourishing chaos. This is also understandable because the Turkish government puts money into it. The government puts money into the project without having a right assessment, so they burn a lot of money on staff that has zero impact. There has to be a realization in certain circles—especially at the Turkish Historical Society—that this level doesn’t suffice. Some people claim “our product is inefficient because it’s only in Turkish and no one can read it.” They should understand that it is good that no one can read it, because once it is translated, it will do more damage than anything else. Some authors areas if talking in their own bathroom. But now within the Turkish Historical Society and among some others there is agreement that production has to meet U.S. University press standards and anything else is a total waste of time. We agreed that we disagree, and then we had discussions about the concept of genocide, we have now discussed joint projects. It’s something else if that will happen or not, but we at least explored what can be done together, in areas where basically you wouldn’t burn the house. After two and a half years in the Turkish archives, they got used to me being in Turkey, there was no scandal, slowly they got used that I am a reality and they get more comfortable and confident about the situation. Personally, I have no problem talking to official historians or genocide deniers because these guys have the nationalist credentials. They don’t have to prove that they’re not Armenian spies so they are very cool about it. They are very surprised that I don’t talk to the “liberals” about it, and I tell them very clearly that it is, in my view, a self-deception to think that a few Turkish scholars—regardless of how good or how bad their work is, how respectable or unrespectable they are—who represent a very small layer, a very privileged layer of Turkish society, the société, the upper one percent, will change the country. These people teach at very few places where very few students go to and they basically dismiss a whole state university system with tens of thousands of history students. So I just ignore them. If you want to talk to people who train the teachers in Turkey, who go to countrywide universities, you have to talk to other people. From a German perspective—I am German and it inspires me given the dialogue of the 1970s and 1980s between east and west—it was always clear that engaging the other side is inevitable and you make them part of the solution. We can’t get rid of all of those we don’t like and then start everything from the beginning, because these people will fight to the end if they have nothing to lose. Respectable scholarship has nothing to do with the name of the person who has written it—it is assessed on its own merit. So people might change and agreements might replace disagreements. Never give up too easy. There’s a substance on which you can move on and I have been involved in it during the last few years. There are hopeless cases among historians in Turkey, of course. At one dinner, one outed himself as a fan of Adolf Hitler. In Germany, I would report him to the police and he wouldn’t leave the country for what he said. This was, at the same time, Holocaust denial, racism and a call for inter-ethnic violence. You don’t have to deal with those guys. There are clear standards. These standards are not to be compromised. But the other guys, I don’t boycott them, clearly. K.M.—You criticize the liberal scholars. But most of the decent scholarship by Turks on the Armenian genocide is done by the liberal scholars and not the ones on the state’s payroll, am I wrong? H.K.—You have to look at the footnotes. Every book tells you what you have done, at least what you claim to have done. Much of it is based on published resources. It shows that they are not at the cutting edge. If you want original research on a certain issue, given the low state of our knowledge because of archival issues and other issues, you have to put in the time. All these concepts about the Armenian genocide are developed on generalization of a very narrow source basis. We have developed a lot of Holy Grail items that we hear over and over again, but these are generalizations of local events that didn’t necessarily spread. There is a lot of crap that we have to throw out, and we have the documents to make that point. One has to be more humble and more relaxed about it and be careful about one’s findings. H.K.—I met him at the Istanbul conference almost two years ago. Then I visited him at the Historical Society’s conference about a year ago, where he received me in a very friendly manner. Then we had little contact and I visited him in June and in November again. Halacoglu is the only Turkish historian who has put material on the table I cannot reconcile with my current knowledge. He is an extremely smart guy, very professional. He is ahead of me in some regards. K.M.—Why do you say that? H.K.—He has the material on the prosecution of war criminals during the war. Meanwhile, I have obtained my own copy of the material, but there has to be academic respect—it means, he has the right to publish it first. According to this material, people who stole money, killed etc., were punished. The list identifies the perpetrators, what they did and what their punishment was. We know, for example, that the murderers of Zohrab and Vartkes Effendi were executed by Djemal, and there were other executions. People who stole money from the Armenian population and put it in their own pocket instead of transferring it to the government got punished. We know this but we need a careful analysis of it. We have no decisive answer yet. K.M.—But they aren’t punishing them for stealing from the Armenians, are they? H.K.—We haven’t researched that. This element is surely part of it, but do we really fully account for it? H.K.—This is not so easy, you have to see who is he. He is the representative of the Turkish state. If there is a real debate between persons with intellect and command of sources, Halacoglu leads the Turkish team. Dismissing him for past weak scholarship or political fanaticism—or whatever argument you want to bring up and you may even have something in support of your point—will not necessarily be productive. Don’t underestimate Yusuf Halacoglu. I respect him. I might disagree with him emphatically but I’m comfortable that I don’t have a fight with him at this point. The academic resources of an entire state converge on this one person. The Armenians have nobody coming even close to the shadow of him. H.K.—First of all, the description of deniers as a group is false. You have people who are fully paid talking heads who have nothing to offer; they are, unfortunately, the people who write the briefs for Erdogan when he goes abroad. Then you have the kind of politically well-connected third-rate academic creatures who are only interested in escalating the situation because they can only live on escalation, because they have nothing to offer. And then you have people who have serious disagreements with you. The way Turkish materials have been used in one recent English-language publication in this country—which is celebrated as great research—is totally unscholarly. The celebration is there because no one is able to check the sources. If that publication had been an Armenian genocide denial publication, there would have been an outcry. Same methods of misrepresentation of sources, speculation, you name it. It’s all there. K.M.—Can you give a concrete example? H.K.—For example, one scholar claims that the president of the Ottoman Chamber was going to Germany in March 1915 to coordinate the decision of the Armenian genocide, and he gives the source. The source says exactly the opposite. I don’t want to go now into detail because I am publishing it. K.M.—Talk about the Ottoman archives. What has changed in the past couple of years? H.K.—The Directorate for Demography in the Ministry of the Interior was reopened. This collection was open for some time in the 1990s and was closed for at least two years since 2005. This was a reopening, not a new opening of collections. The opening of other files is rapid, tremendous. They have opened the Ministry of the Interior files for the Abdul-Hamidian period until the second constitutional period. This is massive. They have also opened the files of the Paris embassy and they are opening more embassy files now. This is at a pace that has never been there. However, there are still files—collections we spoke of in our previous interview, like the files of the so-called abandoned property commissions—that are not made available. We also don’t have possibly the most crucial files on WWI concerning the Armenians, because they were removed in 1919 from the files that were opened so far and have been put in a new collection for the purposes of the government. So this is not—as some people now claim—a cleansing of archives. This is just that certain files were carried from one office to another office in the context of administrative organization. This stuff, from what I understand, is not going to be opened soon, not because the archivists are not motivated, not because they are not interested, but simply because you have so many people and so much work. There is a lack of resources. There is no political opposition now towards declassification and processing. What they simply don’t have is sufficient resources, which is regrettable. K.M.—What is the significance of the embassy files regarding the Armenian issue? H.K.—I haven’t worked with this, but, for example, the catalogs indicate that the embassy files of London, St. Petersburg, Paris provide a lot of insight into the massacres of the 1890s. Also, the embassies were spying outposts. They were spying on the Armenian diaspora communities and the spying was directed by the Ministry of the Interior through the embassies. So you find a lot of Ministry of the Interior material in embassy files and you find embassy reports to the Ministry of the Interior. This is very important because we might have lost some material—physically totally rotten—because of maintenance problems. So you might lose the draft in the Ministry of Interior file but since the letter went out to the embassy, you can have it in the embassy file, because the Paris embassy had a better storage facility. Some of these files have been very recently repatriated, which is exciting. K.M.—You are talking about hundreds of thousands of files, and among them, thousands of files might have relevance regarding the Armenian issue. How many people are actually involved in researching these files? H.K.—There is increasing interest among Turkish historians in Istanbul and the provinces who have not been involved in organized campaigns so far against Turkish “traitors” who say it was a genocide or against “Armenian allegations.” But what has transpired now during my talks is that the Armenians have become a topic. One scholar is publishing 16th-century tax registers from Yerevan—in Istanbul, not Yerevan. This has nothing to do with the genocide but is very important for Armenian history. We have 19th-century income tax registers, 1840s, very important again. So where we are going right now is a periodization of the Armenian cause/issue/problem, as it is called in Turkey. The people no longer mix together the Tanzimat era, Abdul-Hamid era, second constitutional period with the genocide and then the occupation period. We see now increasingly very well-respected and motivated scholars working on it not just because they want to prove or disprove something—that might be just one aspect in it—but because there is interest in the material. From the outside, Dr. Taner Akcam was there some time ago for three weeks, and now he lectures us on the Ottoman archives, for which I’m very thankful. Then, Garabed Moumdjian was there with me in 2006 for two weeks working on the Young Turks on the ARF. He has sent shock waves through the whole establishment. Every time I think about it I’m laughing. An Armenian walked in, he spoke better Turkish than the Turks, he read Ottoman, handwritten documents like we read the New York Times, he talked to the archival staff in Arabic... The idea of the ARF, fanatic, blood-drinking killer and so on got a devastating blow. There’s no one else. He’s the only Armenian who went there possibly in decades (before, only Ara Sarafian went). Which shows that these programs, whatever they do, don’t do one thing: They don’t bring people to that point where many people had hoped they would bring them. So we’re at that point and, this year, it seems I was alone. K.M.—There’s so much research that needs to be done in these archives. Why is the interest by scholars from outside Turkey so little? H.K.—I was criticized by some less-informed elements in the Armenian diaspora for going to the archives because now they cannot say it’s closed anymore. Why did we push for having it open if we don’t want it open? For some people, this was obviously just political talk. I have to be very critical about this. All these donations the community put into research, obviously none of it is coming there. So when I am going there, people should not think that I am going on an Armenian ticket. If there was five percent Armenian money in it, it would be nice. My colleagues ask me in Turkey where all these Armenians are. They feared that the moment they opened the door, a mob would raid their place. So you had basically the cavalry waiting for the Indians to attack and in four to five years one lone Indian has showed up. And so they understand that their projections of a big Armenian conspiracy is just a formulation of their own fears that has relatively little to do with reality. When I say the archives are open, it’s limited, clear, but there certainly is no excuse not to do it. It’s a very simple thing. Crucial evidence, about whose existence we know, is not available at this time. But there is no excuse not to exhaust what they have made available, because this has to be done anyhow. If people say, Well we want to see the rest and then we’ll do something, well that is unprofessional. One has to be at the cutting edge of research. I think this kind of concept is not present. K.M.—What do you think about Turkish Prime Minister Erdogan’s proposal for a joint historical commission? H.K.—A commission would have little to do. We have gone pretty well through the Ottoman archives and not much is left on World War I. So what should a commission do? Xerox the documents a second time? That would be perfect nonsense. The cataloging of WWI files has to make rapid progress to provide an archival basis for a commission. The issue is an illustration that Erdogan does not have the best advisors when it comes to the Armenian genocide. These people develop ideas without checking first whether the pre-conditions for their own proposal exist within their own institutions. Another matter is getting rid of such obstacles as Article 301. I cannot expect anyone to agree with me when that would mean he would be regarded as a criminal for doing so. The AKP government in Ankara has inherited a mess created by its predecessors over decades. So it is small steps for the time being, while hoping that the AKP does its homework and continues its overall positive course. Who, after all, speaks today of the extermination of the Armenians? Perhaps, the ANCA wanted a more dramatic word in the supposed translation. However, many Western academics and even those who accept the Armenian genocide as the truth, admit that it is not a real quote. It is displayed in the Holocaust Museum in Washington D.C. according to some websites, but what is inscribed underneath says "According to Reports received by the Associated Press," so it might as well have been a rumor. Armenian propagandists use the quote extensively to basically point at the Ottomans as the root of all evil and because people do not accept the Armenian genocide due to lack of proo--Armenians claim that this has encouraged people like Hitler and others to commit genocide. Apparently, a great Armenian historian or scholar walked into the Turkish archives and spoke better Turkish than the Turks, which is like saying "a foreigner came into the Washington D.C. Museum of history and spoke better American-English than all the Americans," the claim seems very odd and trivial. He also mentions that "he read Ottoman," well then I would like to know, if Hilmar Kaiser goes to these Ottoman archives to read or to stare? Seems like he is admitting he does not know Ottoman himself. Why would an Armenian talk to Turks in an archival staff in Arabic? The Turkish language only has a handful of Arabic words in the language and to read the Ottoman language you only have to be able to read the Arabic script, it doesn't mean you need to fully know Arabic. Of course some Arabic and even Persian grammar can help in understanding Ottoman archives, but that's not a reason to speak Arabic to anyone. Unless Hilmar Kaiser is trying to imply that Turks are the same as Arabs. This can all be compared to someone going up to American professors in a university and speaking to them in fluent French, it wouldn't really impress anyone. Dr. Hilmar Kaiser conducting a lecture. Kaiser tells the interviewer: "I was criticized by some less-informed elements in the Armenian diaspora for going to the archives because now they cannot say it’s closed anymore". Which is true, but it seems to show that people in the Armenian diaspora are informed but do not want to admit to any realities if those realities help the Turks in any way. Kaiser says "When I say the archives are open, it’s limited, clear, but there certainly is no excuse not to do it. It’s a very simple thing. Crucial evidence, about whose existence we know, is not available at this time." As other Western historians admitted as well as Kaiser that the archives are indeed limited in some way, but not because of intentions or politics but because it is physically difficult for personnel to go through thousands and thousands of documents and there's just not enough resources or funding to do all the archival work that is necessary. Slowly but surely, the Turkish archives are becoming better cataloged and more accessible. This is an interesting observation, because so far, neither Hilmar Kaiser nor any other Armenian-genocide-supporting historian/scholar has proven the Armenian genocide as being an accurate label for the 1915 events using Ottoman archival sources. They have simply made arguments and speculations that it is probably true, but there exists neither documents of direct orders to exterminate Armenians nor any encouragements of killings of Armenians as a whole or in part as defined by the United Nations. What's interesting about it is that, if the Turkish government has people in its payroll that can read and understand Ottoman archives and since they had these archives for over 93 years since the tragedy, wouldn't you think they would just keep the archives locked away and continue this "denial" if they knew they were guilty of the crime but were afraid or too prideful to admit it? Considering that the government blamed for the supposed genocide does not even exist anymore, and the Turkish government was established on ideals of democracy and even fought against the Ottoman government to gain independence (though many like to refer to Turkey as somehow, a successor state?) what would the Turkish government loose in admitting a genocide took place in 1915? That's right, nothing. So who looses if the Armenian Genocide Thesis was accepted by the Turkish government? So who would loose if the alleged Armenian genocide was accepted by the Turkish government? The Ottoman CUP (Committee of Union and Progress) government of 1915 and the specific local Muslims who committed the atrocities would be the losers. Hmm, well most of those people are dead (and if someone murdered an Armenian, they wouldn't tell their sons or daughters, so the "Turks would think their grandparents are murderers" is a false argument), and the leaders of the CUP government were assassinated by Armenian assassins in their "Operation Nemesis" (Yes they actually named their operation). Considering the CUP government ordered troops to go into World War I, and leaders of the CUP such as Enver Pasha (also blamed for the genocide) sent hundreds of thousands of troops ill-prepared to Russia to die in the mountains---it would be ludicrous to assume that any Turk today has ANY respect for the awful CUP government of 1915. For many years, Armenians who now were forced to admit that the Turkish archives were indeed open for anyone to access have been claiming that Turkey cleansed and purified the archives of any evidence that proves the Armenian Genocide thesis. Kaiser says "So this is not—as some people now claim—a cleansing of archives." The problem with the theory and conspiracy that the Turkish government cleansed it's archives is that there is not enough resources for the Turkish government to go through all the archives. If you ever remember the popular fun fact that it takes about 31 years to count to a billion, you should know that there are literally billions of documents in the archives, of records of an empire spanning 800 years, in the 1800s when telegrams became a vital part of empire communication, these archives probably grew exponentially. Kaiser honorably recognizes and praises Turkish historian Dr. Yusuf Halacoglu even though Halacoglu disagrees with Kaiser on the Armenian massacres. It seems to show that Kaiser is a very open minded person, and probably one of the most honest genocide scholars you'll ever read about. It takes a very honorable person to praise his/her opponent. Halacoglu is the only Turkish historian who has put material on the table I cannot reconcile with my current knowledge. He is an extremely smart guy, very professional. He is ahead of me in some regards. He also says "The Armenians have nobody coming even close to the shadow of him." Such strong words by Dr. Kaiser shocked the Armenian interviewer so much that he said "The way you are describing a notorious genocide denier might come as a surprise to many…" To which Kaiser replies "First of all, the description of deniers as a group is false." Turkish Prime Minister Erdogan's call for a joint international commission to research and study the Armenian massacres together is trivialized and rejected by Kaiser. Kaiser says "A commission would have little to do. We have gone pretty well through the Ottoman archives and not much is left on World War I." Yet he ignores the fact that many of the massacres took place before World War I, sometimes by Armenian rebels and sometimes by Kurdish or Turkish bandits or local mobs taking the law into their own hands. The history actually starts way back in 1880s when rebel organizations such as the Armenian Revolutionary Federation and the Hunchaks (Hnchagians) were established. A period of 43 years has vital information that may show the realities of what happened to the Armenians and Muslims in the Ottoman Empire that has thousands of archives still unopened. Join Commission for Historical Research on Armenians in the Ottoman Empire. It was rejected by Armenian historians. Kaiser also criticizes Article 301 because he says that he cannot talk with a Turk openly because if he agrees with Kaiser he supposedly could be considered a criminal under this law in Turkey. Yet he doesn't tell the interviewer that the people that are tried by Article 301 are usually people who publish information slandering Turks as a whole. In the sense, that it is the same type of law that exists all over the world that forbids citizens to be racist or hateful. Many people in Turkey would become angered if someone were to continuously blame the Turks as a whole for an alleged Armenian Genocide. Not because they have something to fear or hide but because they were not even alive back in 1915 so they should not be blamed for any sort of action by the CUP government, regardless of whether it is true or not. Especially if that Turk's grandparents or relatives were massacred by Armenian rebels, then there is clearly an emotional attachment in being blamed for genocide when they themselves were victims of massacres or perhaps a genocidal campaign by rebels. Many Armenians always say that denying the Armenian genocide is equal to committing the genocide and that it is racist. Many Turks say that accepting the Armenian genocide is blaming them for something they didn't do while their ancestors were murdered in the first place. Which is worse? Well if your parents had been murdered by a group, you would want them tried for a crime, to seek justice (the Armenian case), but if that group that murdered your parents was also blaming you for the very crime they committed and people were actually accepting it and seeing them as the victim (The Turkish case), well that's just worse no matter how you interpret it. It's like sending your father's murderer (who happens to be a gangster or rebel) to court only to have the court accept that the defendant is the victim and that his actions cannot be considered murder because it was "self-defense", it would be double the pain than a defendant simply defending himself (even though the Turkish government is really defending an obsolete dead Ottoman government). Kaiser gives free tickets to his lectures to every Armenian student and organization. Though in his lectures he continues to discuss the viewpoint of the Armenians and confirm that the Armenian genocide label is a valid label on history, many Armenians seem to disagree with several points he raises. Perhaps, it's because Hilmar Kaiser is able to admit he himself can also be wrong, which makes him less attractive to the pseudo-genocide-scholars who are trying to deceive the world into recognition of a genocide for which they still have not provided proof of. This essentially positive quality of Hilmar Kaiser, enables people to reach enlightenment and be open-minded about new research and ideas. However, it is a negative quality if you are trying to force political recognition of a genocide in order to satisfy constituents or your peers' emotions and opinions. Dr. Dennis R. Papazian, writes about the alleged Armenian Genocide and Armenian history, especially on the plain white pages of the University of Michigan website (umd.umich.edu) where Armenian propagandists have established a stronghold to which they can legally distribute false or twisted information to students and conduct lectures to convince more students that they should recognize the Armenian genocide or else "everyone will commit genocide". Papazian brought infamous Turkish sociologist Taner Akcam as a "visiting Professor" to the university to give lectures, write and publish books on the Armenian genocide. Though many people believe that Taner Akcam is one of the few Turkish "scholars" (who are supposedly growing in number according to Armenians) who accept the genocide, they forget to mention that he is the ONLY Turkish scholar who accepts it, and that he also has a grudge against the Turkish government, since he escaped a Turkish prison in the 1970s (he was arrested for communist propaganda in a time when the United States was fighting the Cold War, and Turkey was struggling against communist organizations; though Taner Akcam claims he was arrested for writing about the existence of Kurds. Some instances he says he wrote about the mistreatment of Kurds (We really don't know which one!)). Papazian also brought Dr. Hilmar Kaiser, who like Taner accepts the Armenian genocide as an accurate blanket label of history. However, Kaiser and Akcam have a rivalry, and they do not always agree. In fact, Kaiser seems to behave more human and instead of repeating the propaganda and deception of extremist Armenian-genocide-supporters such as Vahakan Dadrian and Richard Hovannisian, he criticizes the deceptive and unscholarly behavior of such propagandists. 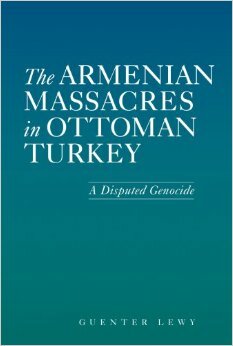 Dr. Guenter Lewy a professor who wrote "The Armenian Massacres In Ottoman Turkey: A Disputed Genocide", added in his book that Hilmar Kaiser actually criticizes Vahakn Dadrian. Adrienne McOmber, wife of Richard McOmber, and mother of Armen McOmber, just phoned me to tell me that she and her husband went to a lecture last night at Rutgers University to hear Dr. Hilmar Kaiser, an event unfortunately sponsored by the Armenian Students Society wherein Hilmar, as he has done for the past several years, badmouthed and denigrated just about all Armenian genocide scholars in the US and Europe, including Vahakn Dadrian and Taner Akcam, and put into question the very reality of a genocide sponsored by the Young Turk government against the Armenians in 1915-1923. The lecture was attended by some apparently high-ranking Turks who smiled and nodded throughout the lecture. They then invited Hilmar to dinner today! They talked with Hilmar in Turkish, but we had Turkish speaker present who understood what was going on. He is attempting to put into question all the valuable scholarship produced by Armenians and their cohorts regarding the Armenian genocide and thus deny that the genocide was sponsored by the Turkish central authorities, making it only a series of massacres carried out on the local level. This is subversive activity at its worse. Unfortunately, an important Armenian patriotic organization had unwittingly sent Hilmar on a speaking tour around the United State a couple of year ago, wherein he did the same thing. I received phone calls from all over the United States warning me about what was going on. Knowing his itinerary, I asked people to record his "lectures" so I would have proof of what he was doing. I then contacted his sponsors who replied that "he attracted young people" and was therefore useful. Finally I had to contact some higher ups who then caused the organization to warn Hilmar that if he spoke against Armenian genocide scholars his tour would be brought to an end. Now Hilmar is back on the road on a speaking tour, offered free to Armenian student organizations, wherein he is now doing the same badmouthing and putting the Armenian genocide, as a genocide, in question. He will speak at Villanova University on Monday, March 31. The man is a clear and present danger. If he puts into question the work of our best genocide scholars, then the Turks have a natural and effective ally against us. He worked for me several years ago and I had to fire him for his dishonesty. I still have the records. All Armenian student groups and all Armenian organizations must be warned not to sponsor his talks and also to attend his lectures when they are inevitable, record the lectures and send a copy to me, and be prepared to defend our genocide scholars against his false accusations. This behavior of outcasting anyone who strays even the slightest bit from the black-and-white propaganda factory of the Armenians has been conducted for decades and is very effective in quashing and cleansing dissenting opinions. To the Armenians, there is no such thing as point of view, (which is why Armenian nationalist Wikipedians do not even know what "WikipediaPolicy:Neutral Point of View" means) instead there is the one-voice of truth that says what is true and what isn't and we sometimes forget that truth is relative and subjective. An example of the relativeness of truth would be someone saying "John didn't study much for his test", but John may say "but I studied for 4 hours!" which may BOTH be true, but it can depend on how much studying is enough. So historians take extra care when accepting and/or rejecting certain information, and always keep an open-mind to new research which can disprove it. Even the most established laws of physics have uncertainty. Finally I had to contact some higher ups who then caused the organization to warn Hilmar that if he spoke against Armenian genocide scholars his tour would be brought to an end. So perhaps organizations like the Armenian National Committee of America and it's umbrella group the Armenian Revolutionary Federation (the same one that massacred hundreds of thousands of Turks, and is a well-respected political party today) do have some sort of political and financial power. So what should one learn from all this? Whether you believe the Armenian genocide is an accurate label or whether you believe it is an inaccurate and racist blanket-word for a large and complex history of the Ottoman Empire, you will agree that it is always good to keep an open-mind. It's good to see things from several perspectives and that is what the lesson you should learn from Hilmar Kaiser's experiences. Kaiser always keeps to the Armenian-Genocide thesis, but perhaps one day he will discover that he might have been wrong about many key facts about that history, especially since the Armenian "scholars" do not like dissent or open-minded views. They regard the disagreement of their historical research as an attack against their people and their belief system. We once believed that the Native Indians were savages that attacked people for no reason, today historians know that the Native Indians were very peaceful and seldom resorted to violence. It's possible that one day, people will see Turks as normal human beings (with good and bad apples), and not as genocidal Muslims as the Armenian propagandists want you to believe.